The apple tree is one of the most widely cultivated of fruit trees. They are deciduous (they shed their leaves in the autumn) and are small reaching just 5-12 m tall. They normally flower in spring, producing white flowers, sometimes with a pink tinge. The fruit matures in mid-late autumn, and can be eaten raw, used in cooking, juiced or made into cider. There are more than 7,500 known cultivars of apples. The world's biggest collection is housed at the National Fruit Collection at Brogdale farm in Kent. There are three main types of apple tree, each producing either: dessert, cooking or cider apples. Over the years the variety of apples commercially available has diminished. Customers have been left with a poor choice in supermarkets that tend to be chosen for their storage ability rather than their taste. English varieties are some of the tastiest varieties of Apple available, with a crisp, fresh taste and wonderful exuberant names to match. Egremont Russet – traditional dessert apple with distinctive nutty taste and thin, dry texture. 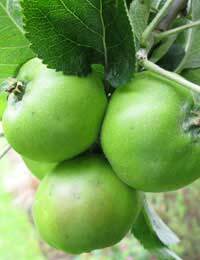 Bramley's Seedling – tangy, sharp flavour. Fruit is large and greenish-yellow with light red striping. Cathead – very old large round English apple with greenish-yellow skin that supposedly resembles a cat’s head. Brown's Apple – a vintage apple, which makes a tangy, scented, fruity cider. It is dark red with creamy flesh that is often stained with red. It has a crisp, clean flavour. Like most perennial fruits, apple trees are propagated by the grafting a cutting of an existing variety on to the root of a new tree. This is because you can’t guarantee that a tree grown from the seeds of an apple will be the same as its parent tree. Growing apple trees from seed can result in brand new cultivars, however, so many breeders deliberately cross-fertilise specific varieties to produce new breeds. Apples can also form bud sports. These are mutations of the cultivar on a single branch. Some bud sports can actually be improved strains of the parent cultivar. Some differ sufficiently from the parent tree and can be considered as new cultivars. Apple trees can be grown in orchards, large pots, or trained as espaliers along a wall or trellis. If you want to grow your own apples, you will need at least two trees so they fertilise each other and produce more fruit. There aren’t many flowers in bloom in early spring when the apple trees are in blossom, but it’s a good idea to plant primroses and rosemary in your garden to attract early bees and other pollinators, who will pollinate your apple flowers and increase your yield. There are self-fertile varieties, however, such as Jonagold, if you are short of space. A common problem for apple growers is a late frost that destroys the flowers and therefore prevents them from turning into fruit. It is best to plant the trees on a slope or against a wall to help prevent it from frost attack. You could also try growing a frost-resistant variety such as Court Plendu Plat, which is known historically as ‘the wise apple’ because it flowers late and avoids the harshest frosts. If the frost is not too severe, the tree can be sprayed with very cold water before the morning sun hits the flowers. This helps the cells within the flowers re-adjust to the warm temperature easier, and can help save your crop. Before buying your apple tree, consider what size (height and spread) is appropriate for your garden. The size of the tree can be determined by its rootstock (the lower part of the tree on to which different varieties are grafted). The label should also tell you how fast the tree grows and how high. Apple trees are normally sold as either one or two year old plants. If you want your tree to produce fruit sooner, it’s best to opt for a two year old tree. Dig a hole deep enough to just cover the soil mark on the stem of your tree and wide enough for the roots to spread themselves out 30 to 45cm (1 to 1.5 ft) should usually be about right. Part-fill it with compost and place the roots in it. Tie the tree to a support and fill in the hole with soil, firming gently. Water well, and ensure it is well watered during dry spells. You should have apples within two years. @Kk1970 - it would be something you would have to do an online search for. There are sites that give different varieties of apple trees RHS may be one avenue to look. Or take an apple to your local garden centre, one of their experts may be able to tell you. How can you tell what variety of apple my tree is? @Janex - if the tree has deep pink flowers and dark red fruits it might be a crab-apple Malus Harry Baker. If it is they make for great crab-apple jelly. We have an apple tree that has a small dark red apple but totally inedible, very sour. Has a dark red blossom in spring. Can anyone tell me what it may be? @Liz -I guess give it a chance next year. Perhaps with the cold snap beast from the east much was delayed or killed. I had one sprig of blossom on my tree and of course no apples to follow. I lost so many plants in the garden too. My apple tree was professionally pruned in the snow last February. It looks beautifully healthy now but I’m worried that we have fewer apples than usual and it is thick with leaves. Should I do anything? @Gayle- there could be many problems. An apple tree without fruit may not be getting enough sun or water or it could be over-fertilisation. Heavy fertilization may encourage lots of leafy growth, at the expense of your fruit production. Lack of regular, moderate pruning can also cause problems. If buds have been forming and not opening, it is probably the weather that's at fault. A particularly cold, windy winter can damage susceptible flower buds. The 'beast from the east' and the late spring could also be the fault. So, it's hard to advise you. Checking whether your tree is healthy is the first thing you should do. Hello , my self pollenating apple tree was terrible last year . The few apples that came seemed to be rotten . This year I’ve had a fantastic bloom and now th flowers have gone . Where the buds should have turned into the start of apples , when you touch them they just fall off . Can you tell Me what’s wrong please . @nige - the apples may not be ripe enough - are you picking them too early? Or the fruit might not be getting the right nutrients from the tree. To test if the fruit is ready to be picked, lift and gently twist. If the apple doesn't come away easily in your hand, then it's not ready to harvest. Last year I found fungal growth at the base of my tree. The fruit that year was the worst crop in the 20 yrs we have lived here. This year it has blossomed but all the blossoms have become dry dead, there are no leaves on the tree. Do you think the tree has died. @fred - A tree with no leaves when spring comes indicates your tree in some distress. While your dog urine has some acids and salts that can create damage, rain should take care of this by diluting it, especially if it is an established tree. The bark is a tree’s protective barrier - but if there has been damage infection can occur causing disease, dehydration and nutrient loss. Also, if the dogs are still peeing, seepage from the base can still open a wound below and can kill the tree via the roots. Make sure no dogs are peeing on it and if you've had blossom then it may heal. I wouldn't cover the wound personally, like any wound I'd let the air at it, just not the dogs. You may be able to build a barrier of sorts. Any one else know any better? @Net - The apple sawfly causes the ribbon like scars on the outside of the fruit. They are small wasp-like insects which lay their eggs on the blossoms. The eggs then grow into maggots which tunnel just below the surface of the apple skin. As the maggots grow, they burrow directly into the middle of the fruit, causing the fruit to drop prematurely, usually in early July. If this seems a correct analysis, then you would have to spray Thiacloprid (Calypso) which generally controls aphids but at petal fall it can control of apple sawfly. My Braeburn tree has never produced more than 3 apples. This year I have 4! Only they are so different. They have turned into an apricot tree. How can this possibly happen? Hi, I have apples and apple blossom at the same time.Is this normal? @Lucie - perhaps your tree didn't go into dormancy last winter. If it hasn't you'll get delayed foliage growth and little or no flower growth. If a fruit trees does not flower, it can't undergo pollination and produce fruit. We moved to new house in Warwickshire last December, and our garden has an old apple tree that was very prolific last year, there were tons of windfalls when we moved in and some apples were still hanging on the tree. I made jams, pickles, apple pies, crumbles, and even apple soup, plus the birds feasted on the rejects for months. By now (11 June) any apple tree should have leaves and flowers on it. But our apple tree is still completely bare, though it has numerous tightly closed buds. I did a scratch test, and it's still green, so it's definitely alive. Any ideas why it's still dormant? Any advice on what to do? I recently bought a house in UK and there is a apple tree in the garden. The fruit is not sweet and tasty which makes it difficult to consume directly. I am not sure what variety it is and would need some advice why the fruits are non eatable. There are many possible causes of poor crops of fruit, from environmental conditions such as weather (i.e too hot, cold, dry, wet), plus pests or disease to more controllable causes, including overpruning or underfeeding. You can see more via the RHS link here.